When I was five years old, my mother always told me that happiness was the key to life. When I went to school, they asked me what I wanted to be when I grew up. I wrote down 'happy'. They told me I didn't understand the assignment, and I told them they didn't understand life. 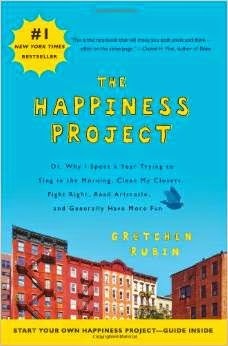 I was in an airport bookstore when I first picked up The Happiness Project by Gretchen Rubin. I was hooked by the blurb on the back cover, because it sounded a lot like me. I'm not an unhappy person - I've got a supportive husband, two awesome kids, a comfortable home, a fulfilling business, and good health. But I definitely could be happier. For me, this book wasn't a step by step guide to achieving happiness. A lot of Ms. Rubin's suggestions were pretty basic stuff that we've all heard a million times. But it did force me to be more mindful of my happiness, and to set up a "Happiness Project" of my own. The author's sense of humor, research and presentation of positive psychology, and use of philosophy made the book very enjoyable - just reading it made me smile! Although I didn't follow every suggestion in The Happiness Project, it did inspire me to look for more happiness in my every day life - and who couldn't use more of that? I have heard great things about this book. I want to read it even more, now. Playing with my family and friends makes me most happy. I also love a juicy book...thank you for the suggestion. Redbox has a movie that might make you smile called Moms' Night out about a blogger mommy like you...grab a friend and give this chick flick a gander. Let me know what you think...forwarning, it's cheesy! I've heard of the movie but haven't seen it yet. I'll definitely give it a try! This is the second review I've read of it that actually made me think it might really be a good book for me. And you and I seem to think alike a lot! We definitely think alike. I think you'd really enjoy the book. Oh my goodness, Lana! I loved this book as well, and keep it my nightstand - I even bought it in an airport bookstore as well! It was sort of a pre-step in my journey towards beginning to blog! We get more similar every day! Great book! Have you read her second one? It's called Happier At Home. I liked that one a lot, too! I haven't read it yet, but it's on my list! I got that book as a gift a while back & loved it... so I recommend! I love getting books as gifts - especially when I enjoy them! Yay! I guess we need to read her second one now - see above comment! I'm adding this to my reading list! I can use more happiness in my life! I'm always looking for as much happiness as I can get! I agree with you--everyone needs a little more happiness in their life! I read that book too! You're right, it's all about being mindful of happiness. I think I need to read it again actually. And great quote by John Lennon! Thanks - you gotta love John Lennon! I need to read it again too. I hadn't heard of this book before! I'll have to check it out! You will love it Rena!